Last week Club Penguin asked us what we liked about when Rockhopper comes. "I think the best things when rockhopper returns is when you get to meet the famous pirate and get his speacial items! You can also go on his ship and player his game Treasure Hunt!! So there the best things when rockhopper returns!" For next weeks Reviewed By You, Club Penguin wants to know all the ways that you're going to celebrate change during Coins For Change! This is cool mimo!i cant wait till coins for change.Can u? where has snow game gon? That was a 2 day event (Nov.27-Nov.29) so its finished now. Hope i helped. This was actually a temporary game. It went on from November 27th-29th. mimo guess what club penguin toys has a pins section please give me credit or at least got to my blog. Mimo my birthday is on Friday! Tommorrow, December 4th! mimo do you know toontown? I'm pretty sure he does! 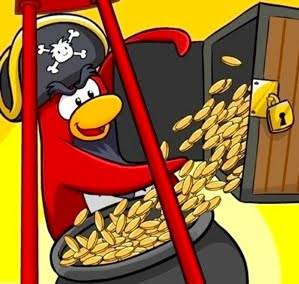 That's a interesting theory, I mean what if it's ture, that rockhopper is evil and is stealing the coins and some day the agents will find out and put him in jail? Or maybe he has teamed up with herbert and is planing to melt clubpenguin! or herbert has mind controled rockhopper to do the whole thing. Ever interesting theory and who know's maybe it's ture. It means what will you do to celebrate doing coins for chnge Mimo!! I know I can't! Haha! It was 2 days only. So it is bye bye. Yea. It happened to me too. Report this to Club Penguin Support. Yea. he does. But you only get 3 free days to play it then you have to pay. The maze was only around for a couple of days.Hope this helped! You mean the snow maze? Yeah, that ended last weekend! Sorry! I think it means, like...umm...I realyl don't know. Srry, Mimo! P.S. I couldn't do any modding yesterday, our skool had a dance, so I was gone for the night! And I had a club and choir today, too, so now I can get on!! What did I miss? Oh, never mind, I'll just see the other blog posts! Pins? Really? Like, do you mean like a toy store that sells CP stuff? Or is there some section in CP with that stuff? Anyways, sa-weet! I hope Mimo gives you credit!! Awesome!! Oh, now I get it, I commented about someone else saying that, too, so, yeah, I'm gonna check it out! That wasn't an actual game. It was just an activity from the 27th to 29th. Congrats jjribcool! spend your coins wisely! Mimo there are now pins on the CP store a Lanyard medal, mystery pin set, and a puffle mini pen set. If You click sensies amulet (Under his beard), he hints that there will be new ninja rooms. Don't you have to go to school Mimo? You always post at like 10 am and thats when school is still in! Cool! Can't wait until Coins for Change (but my membership expires in 3 days). How do I post a comment for Reviewed by You? It means that they wanna know how you will celebrate coins for change. The snow maze was a two day event unfortunatly. So what are you guys getting for christmas????? Idk what it means but im saving up to help kids! maybe when next week comes we should speak up and say we want change in clubpenguin about having not to pay to be a member since theres an econmy problem going on and theres less and less money to pay to have a good time ..plus why should we pay to become a member it seems unfair who agrees? giving coins for coins for change is great. I give to each catagorey until i need more coins. i love helping and i cant wait until coins for change is here i am SO excited!!!!!! Personally, i think that celebration of change is most special this year because we all are entering a new decade. CP also wants to celebrate the most waited arrival of card jitsu fire. To confirm previous thoughts, a meeting with the sensei ahows that card jitsu Water&Snow are on the way.